The new keyboard sports RGB lighting where every key can be customised via the Corsair Utility Engine (CUE) software. 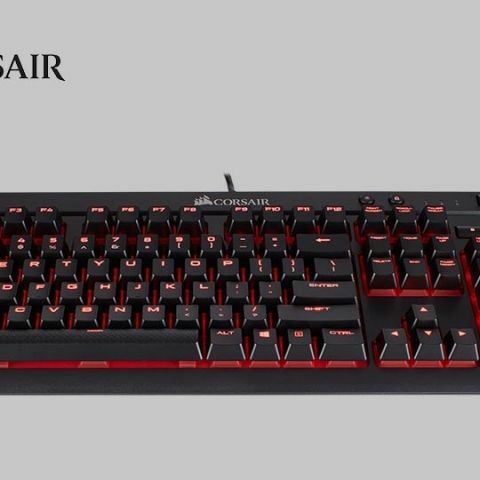 Corsair has announced its new CORSAIR K68 RGB water-resistant mechanical gaming keyboard. The peripheral features individually customisable RGB keys and is IP32 certified spill proof. Corsair says, "Like all CORSAIR mechanical keyboards, the K68 RGB uses only German-made Cherry MX gold-contact keyswitches for the utmost in reliability and consistency. Each switch is rated to over 50 million key presses, ensuring that the 50 millionth key press feels just as good as the first. Available with Cherry MX RGB Red switches, which provide a smooth, quiet and linear action, the K68 RGB's keys feel instantly familiar, whether you're typing or gaming." CORSAIR, a world leader in PC gaming peripherals and enthusiast components, today announced the release of the new CORSAIR K68 RGB water-resistant mechanical gaming keyboard. Equipped with 100% CHERRY MX RGB keyswitches, every key on the K68 RGB is individually backlit and programmable, giving PC gamers virtually unlimited lighting customization in a vivid array of colors. Every keyswitch is also individually shielded from dust and liquid spills to an IP32 protection rating, defending against accidents so that gameplay never has to stop. Loaded with extras, from a removable wrist-rest to dedicated multi-media keys, and fully programmable with CORSAIR Utility Engine Software, the CORSAIR K68 RGB offers ultra-durable RGB gaming. Like all CORSAIR mechanical keyboards, the K68 RGB uses only German-made Cherry MX gold-contact keyswitches for the utmost in reliability and consistency. Each switch is rated to over 50 million key presses, ensuring that the 50 millionth key press feels just as good as the first. Available with Cherry MX RGB Red switches, which provide a smooth, quiet and linear action, the K68 RGB's keys feel instantly familiar, whether you're typing or gaming. With stunning RGB lighting embedded into every keyswitch, it's easy to light up K68 RGB in almost any way you can imagine, from smoothly shifting colors and transitions to dynamic reactive effects. Choose from dozens of pre-programmed presets, thousands of user-made downloadable profiles, or create a unique custom lightshow, all from with the powerful CORSAIR Utility Engine (CUE) software. CUE also offers complete lighting synchronization between compatible CORSAIR mice, headsets and accessories with a single click, making it easy for gamers to make all their gear match. Every key is also fully programmable in CUE, from simple re-maps to complex multi-function macros, giving gamers the crucial edge when they need it the most. With an affordable MSRP of $119.99, you'd be forgiven that K68 RGB's features stop there, but instead it's fully loaded with all the CORSAIR extras gamers have come to expect. A removable full-length wrist rest provides complete comfort, dedicated volume and multi-media controls make audio adjustments instant, and a Windows Key Lock Mode prevents those game-breaking interruptions. K68 RGB is also 100% anti-ghosting with full key rollover, ensuring every key press registers faultlessly. Equipped with the best in CORSAIR lighting, customization and durability, the K68 RGB ensures that whatever happens while you game, you'll be able to play on.